In 2001 we remembered the 65th anniversary of the launch of shortwave broadcasting in Czechoslovakia. Five years later we are celebrating another big anniversary, our 70th. We described in great depth the history of Czechoslovak and Czech international broadcasting in a text entitled "65 Years of Radio Prague". The following lines, therefore, are devoted to developments in the last five years, from 2001-2006. In terms of programming Radio Prague has remained focused on informing the international public about news and events in the Czech Republic. The basic programming scheme for all six languages is a half-hour broadcast made up of news, a current affairs block featuring reports and interviews about the most important events and thematically focused features. The main media on which programmes are broadcast are shortwave and the internet. Radio Prague uses a 100kW shortwave transmitter in Litomy¹l. Retransmission on shortwave transmitters in Russia (Krasnoyarsk, Novosibirsk), Ascension Island in the Gulf of Guinea and Sackville in Canada is used in order to improve reception in some target territories (Germany, Russia, Latin America, North America). Radio Prague also closely monitors developments in digital technology, above all DRM. The DRM system, unfortunately, has not reached the level of diffusion it would need in order to be used effectively. 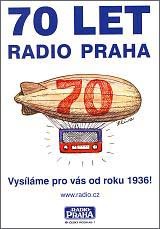 To mark the 70th anniversary of Radio Prague a meeting with listeners was held on June 22nd. It included a visit to the old transmitter building in Podebrady, from where we started broadcasting in August 1936. Anniversary diplomas and special stamps were also given out. August 31st is a very special day for Radio Prague. Exactly 70 years ago, in 1936, Radio Prague made its first ever broadcast in English. But radio is not only about interviews and reports. The main reason we are here, are you, the listeners, in the case of Radio Prague scattered all around the globe. Radio Prague made its first ever broadcast 70 years ago, on August 31, 1936. Ahead of Thursday's anniversary I visited our original transmission centre in Podebrady, central Bohemia, in the company of Czech Radio's shortwave expert Oldrich Cip. In the second half of this two-part report, he and I discuss - among other things - the beginnings of Radio Prague, Communist-era radio jamming and the future of short-wave broadcasting.